Designed for professional developers and administrators, this NGSS Early Implementers report presents 10 tools and processes that are central in the professional learning provided to teachers and administrators in the participating school districts. The tools and processes are designed to aid NGSS lesson planning, NGSS instruction, and administrator support during implementation. The report describes each item, how it has been used, and how participants are benefitting from it. Other districts and schools can learn from, draw upon, and adapt the tools and methods to support their own implementation efforts. 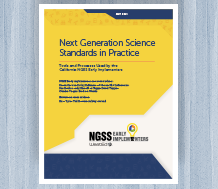 Visit the Next Generation Science Standards in Practice: Tools and Processes Used by the California NGSS Early Implementers resource page to learn more and download your copy.